You must check the box if you would like to subscribe. Thanks for signing up! You'll receive a confirmation email soon. Prefer to call? We’re available! Call (855) 258-5310 to book with our savings specialists! Trvl.Deals is a leading travel comparison site that lets you find cheap flights, hotels, car rentals and vacation packages online. Whether you're traveling for fun, business, adventure, or relaxation, your ideal trip is simply a click away! 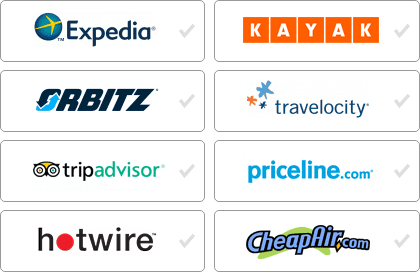 You can compare airline fares, hotel rates, and car rentals from all the top internet travel sites in one location. Finding cheap flights has never been easier. Save time, save money; there's no need to visit website after website to find cheap airline tickets or the best deals. It's all here for you in one location.